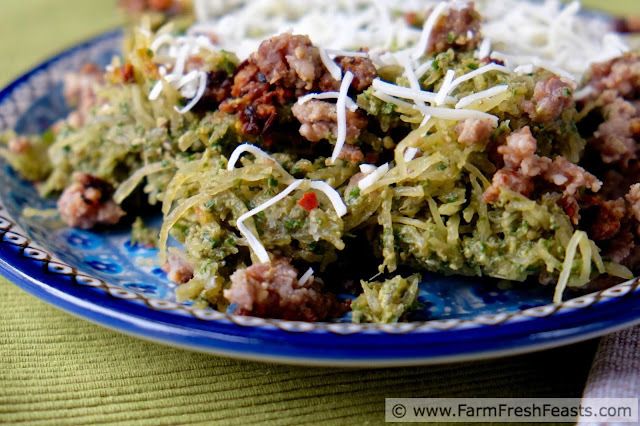 A low carb entree of baked spaghetti squash tossed with mustard greens pesto. 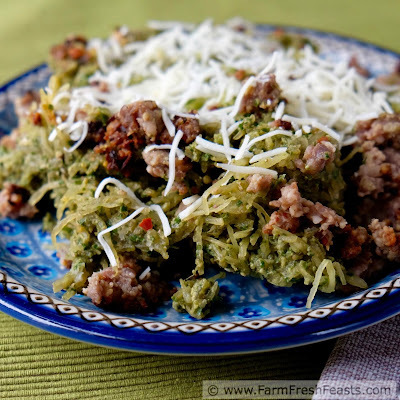 Jazz it up with crumbled Italian sausage and cheese for a farm share dinner to please the while family. I'm going to preach today. If you're in the choir, skip on down or shout Amen! as the spirit moves you. I want to talk to the folks, LIKE ME, who get overwhelmed by the produce in the Community Supported Agriculture (CSA) farm share box. The folks who don't want to keep on with a farm share because they we don't know what to do with ________ [insert name of farm share ingredient here] before it goes bad. It's why I started this blog, after all. The thing is, we all eat. Heck, my spouse and kids want to consume food 4 to 6 times a day, every single day. It doesn't make sense to waste the food already in your fridge. After all, you've paid for it, you know? Not to mention that your farmers have grown it. So practical tips like this one help you us to make the most of the farm share. 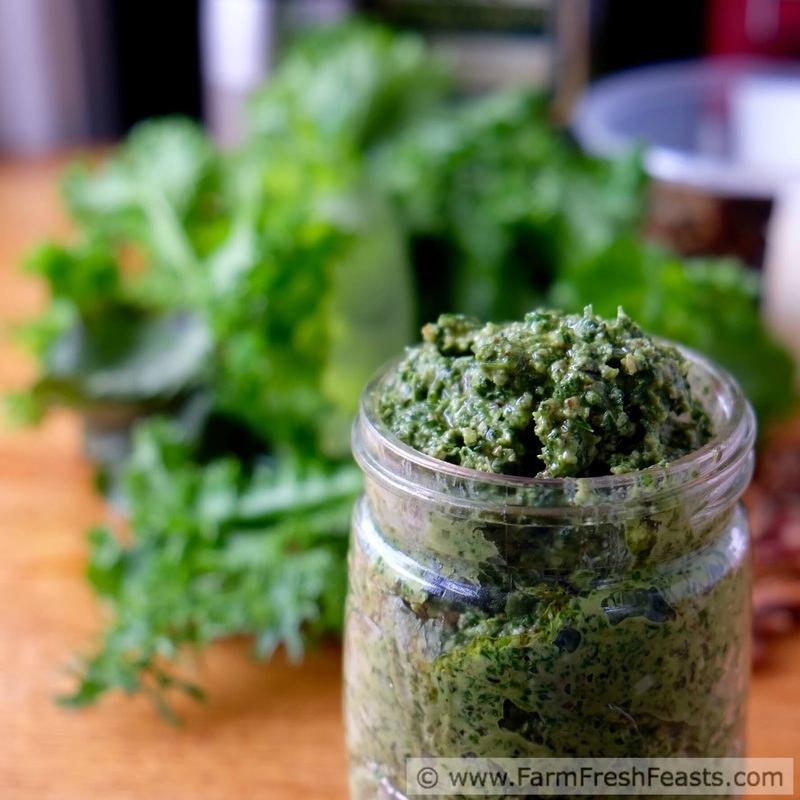 A while back I shared a recipe for Mustard Greens Pesto. You can find the recipe here. This recipe makes quick work of a large volume of mustard greens and can hang out in the fridge or freezer until you are ready to use it. Since my farm share is about 25 weeks of the year, there is plenty of time for me to enjoy put up farm share produce on the off months. This low carb recipe is flexible. 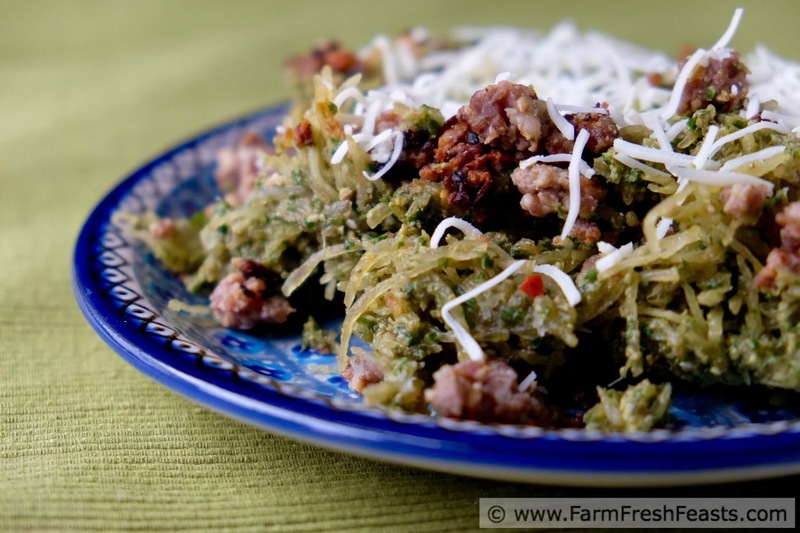 I could have stopped with just the pesto and made it vegetarian, but to tempt my family I browned half a pound of Italian sausage and served that over top. Plenty of cheese seals the deal for everyone who loves cheese. 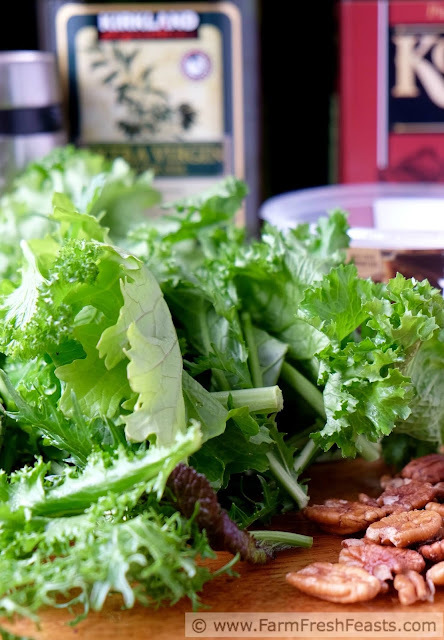 For other recipes using mustard greens, please see my Mustard Greens Recipe Collection. 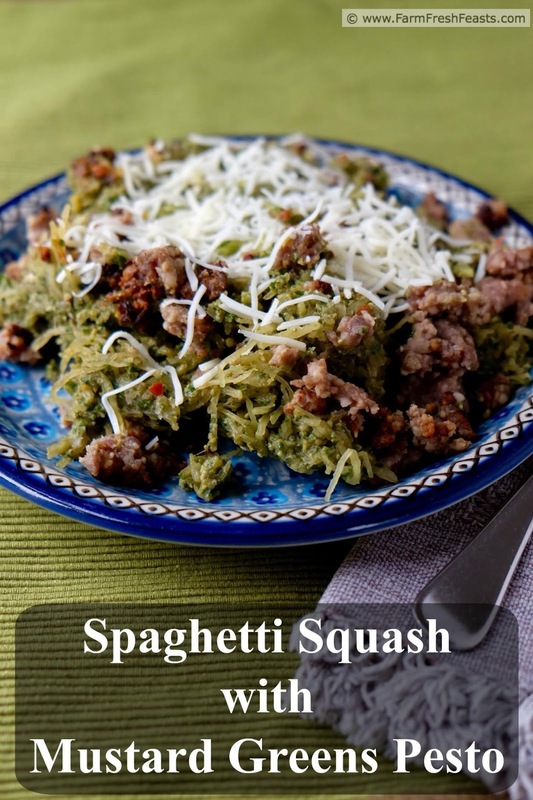 For more recipes using winter squash [as spaghetti squash is a winter squash and this is it's debut on the blog] please see my Winter Squash Recipe Collection. These are part of the Visual Recipe Index by Ingredient, a resource for folks like me eating seasonally from the farm share. For more recipe ideas follow me on Pinterest and for my latest epic fails check out my Facebook page. Want to know how to use this blog? Click here. Place squash halves face down on a rimmed baking sheet. Pour a cup of water onto the sheet. Bake for 30 to 45 minutes, depending on the size of the squash, until it gives when you squeeze. Remove from oven and use a fork to scrape the stands of the squash into a large bowl. Toss with pesto, adding olive oil to make a sauce if desired. Serve with cheese and sausage, if desired. I actually roasted and ate my first spaghetti squash last week. I love your idea of incorporating pesto. Speaking of which, I need to go cut down the last of the basil before the cold and wind takes in, so I can get in one last round of pesto. I hope you were successful at putting up your pesto. I'm looking at a bag of arugula and thinking I'll put up some of that as well. While I'm thinking on it--I also need to add the new photos to the old pesto post. Ah, the to do lists . . .